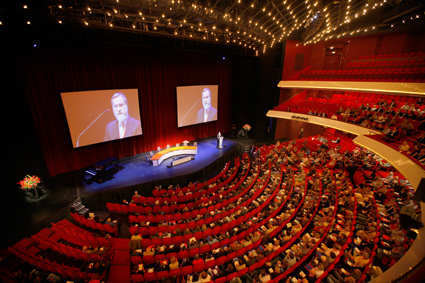 6 September 2009: Tolerance versus fundamentalism "PASSION for FAITH, DEATH and FREEDOM"
An impressive keynote speech by Jonathan Sacks, chief rabbi British Commonwealth of Nations. Stereotyping the Jew during ages shows that people does not learn from history and therefore history repeats itself. Sacks tried to relate religion with liberal democracy. Many Jewish writings are in fact on a part with liberal democracy. Both systems starts with reciprocity: my freedom should not cost the freedom of another: God created diversity. Speakers even stated that "God is back". Religion is a fundamental basic need for humanity. We need civil stability and guaranteed freedom of religion. But does democracy and religion exclude each other? Although democracy is in fact derived from christianity, the form of state can not quite be seen as a condition for a better society. Faith is not what some people think it is. Their human dream is a delusion. Because they observe that faith is not followed by good works or a better life, they fall into error, even though they speak and hear much about faith. ``Faith is not enough,'' they say, ``You must do good works, you must be pious to be saved.'' They think that, when you hear the gospel, you start working, creating by your own strength a thankful heart which says, ``I believe.'' That is what they think true faith is. But, because this is a human idea, a dream, the heart never learns anything from it, so it does nothing and reform doesn't come from this `faith,' either. Instead, faith is God's work in us, that changes us and gives new birth from God. (John 1:13). It kills the Old Adam and makes us completely different people. It changes our hearts, our spirits, our thoughts and all our powers. It brings the Holy Spirit with it. Yes, it is a living, creative, active and powerful thing, this faith. Faith cannot help doing good works constantly. It doesn't stop to ask if good works ought to be done, but before anyone asks, it already has done them and continues to do them without ceasing. Anyone who does not do good works in this manner is an unbeliever. He stumbles around and looks for faith and good works, even though he does not know what faith or good works are. Yet he gossips and chatters about faith and good works with many words.